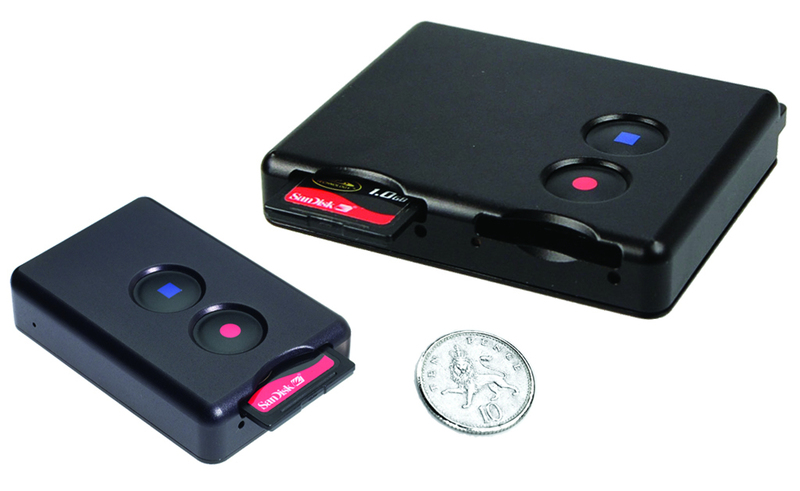 FlashBack-3 is a miniature digital video recorder with small dimensions, advanced H.264/AVC video compression and has the ability to stream video over IP networks. FlashBack-3 is ideal for demanding covert video surveillance operations. FlashBack-3 is available with either single or dual SD card slots. The single is highly compact whilst retaining valuable features such as local or remote record switches, internal camera power supply (5, 9 or 12 V), USB and Ethernet interfaces, and internal Knowles microphone together with an optional internal battery. The dual has the same feature-set with a second SD card slot to increase record time and an internal RJ45 Ethernet socket for easy networking. FlashBack-3 typically offers over 1 hour of record time per GB of full resolution, high quality video and audio, which can be increased further by user configurable time-lapse modes. Flashback-3 is highly flexible with an extensive multi-function user interface including DC input of 6 to 28V, video and dual audio inputs with monitor outputs, external microphones (with bias), external record switches and triggers and serial and USB interface ports. One of the key features of the system is an internal programmable PSU that can power an external camera with 5, 9 or 12 volts at up to 500mA (at 5V). For ease of use, a number of pre-wired cable clamp assemblies are available which are easily installed to the rear of the unit. One of FlashBack-3’s most powerful capabilities is the RJ45 Ethernet connection that is used to remotely control and configure the unit. A web page interface allows for remote control of the unit together with streaming live video over an IP network. 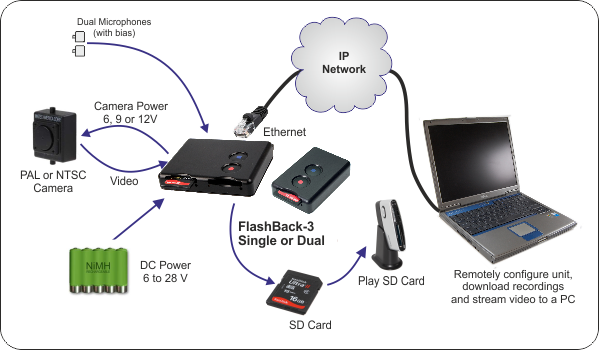 Flashback-3 is able to record and stream video simultaneously so it is possible to record in high resolution whilst monitoring the live video feed in a lower resolution over the Internet. Once recordings have been made, they may be viewed by removing the SD card and using a standard PC software application (H.264 codec upgrade may be required). The recorded files may also be downloaded using the USB port or remotely via the Ethernet interface. FlashBack-3 is available with an internal battery option that can power the unit for up to 1½ hours. Further options include internal motion detection with 16 user configurable zones. Mechanical Size Single; L:60 x W:40 x H:13.5 mm (Height 18.5 mm with internal battery option). Dual; L:80 x W:75 x H:13.5 mm (Height 18.5 mm with internal battery option). Finish Hard anodised black aluminium. Weight Single: 45g (without card and battery). Dual: 67g (without cards and battery). DC Power Input 6 x 28 V DC. Current Consumption < 100μA stand-by. < 1.8 Watts in stop (155 mA typical at 12V). < 2.4 Watts recording & streaming (200 mA typical at 12V). DC outputs External camera power off; 5, 9, 12 or 16 V.
500 mA at 5 Volts, 200 mA at 12V. GPS power; off, 3.3 or 5 V at 500 mA max. Operating temperature -10 to +50ºC when suitable SD card is fitted (eg SanDisk Extreme III). 0 to + 35ºC with internal battery option. Record Control Local record start / record stop buttons. 2 external inputs activated by contact to ground. Default: Input 1; record switch, Input 2; record on trigger. Option: Input 1; start recording, Input 2; stop recording. Internal vibration alert on record and stop. Internal battery option Single: 1 x lithium-polymer cell proving approximately 1.5 hours record time. (without powering external cameras / GPS etc). Dual: 1 x lithium-polymer cell proving approximately 2 hours record time. Configuration Web page interface via Ethernet connection. Recording media Single and dual flash memory card(s) with support for SDHC (Secure Digital High Capacity) Cards should be at least x 133 speed. Connections Molex 1.25mm pitch headers. See Mates with Molex 51021 connectors. Interfacing cable clamp assembly to various connector combinations available. RJ45 Ethernet connector (Single RJ45 connector via adapter). Video input NTSC or PAL, composite or Y/C. Video compression H.264 / AVC, MPEG-4 part 10. Playable in QuickTime, VLC etc. Video record rate Real-time (25/30 frames per second) and user configurable time-lapse modes to 1 frame per second. Video resolution Full standard definition (NTSC 720 x 488, PAL 720 x 576). Video Streaming Full rate CIF resolution H.264 streaming of live video input. Can record and stream simultaneously. Bit rates from 100 kbps to 800 kbps. Onscreen display Recorded text overlay of date and time (in European & US formats) and GPS coordinates. User configurable position, text colour etc. Audio input Dual channel microphone / line level, user configurable. Automatic gain control (AGC) on/off. Audio format Stereo 44.1 kHz 16 bits per sample, AAC compression. Motion detection (option) 16 user configurable zones with selectable sensitivity. Ethernet Interface RJ45 socket Dual, RJ45 adapter cable on Single. Programmable IP address (DHCP optional). HTML Web page configuration (password protected). Download of files via HTTP. Secure web and file download (via future upgrade). Dual recorder can be powered by Power over Ethernet (PoE). Other Interfaces USB-2 slave interface for file download. Shows the SD card as an external drive. RS232 port, can interface to GPS receiver to show coordinates onscreen or to control external PTZ camera etc. Due to continual product development Ovation Systems reserve the right to change specifications without notice. E&OE. 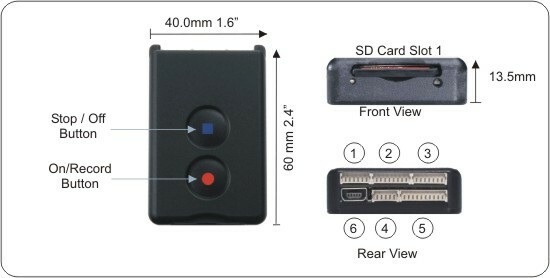 Highly compact and rugged SD card digital video recorder (DVR) with Ethernet interface. Ethernet interface for IP networking, video streaming, remote file download and configuration. Can record and stream video simultaneously. Single or dual SD memory card slot options. SD high capacity (SDHC) supported. Real-time and time-lapse record and stream modes. Internal programmable camera power supply at 5, 9 or 12 V.
USB interface for easy download of files. Recorded video files compatible with most software players*. Optional internal 16 zone motion detection. RS232 interface for connection to GPS receivers, PTZ controllers etc. * H.264 Codec update may be required.